Most of the time we give people what we love, not what they love. We must give what they love. And what does God love? God loves complete surrender. God loves love that is not tinged by your likes and dislikes. Mostly, what human beings call love is 'like'. What is love? [devotees answer] 'like'. And the opposite of like is dislike. That's all. Mostly we can only reach the 'like' level. We mistake like and call it love. You see – if we spell 'l-i-k-e', what does it give us? 'Like'. L-i-k-e is?...like. And if you take out the 'i' [ego, ahamkara] and replace it with an 'o' - that becomes what? Loke. Loka in Sanskrit means 'world' and as long as there's world and you live in the world, there will be birth and?... death. Now take the word 'live'. Who lives? L-i-v-e, live. Take out the 'i' and replace it with an 'o' – what is it? [devotees answer] 'love'. And love only lives. Because it lives beyond the world. Because it lives beyond?...the world. Not in the world. So with 'like', if you take out the 'i', you get loke. Loke or Loka [world, realm] implies birth and?...death. L-i-v-e, live – he who lives, really lives, is he who realises immortality. And what is immortality? Just love. Now Jesus Christ said 'sin' – what is a sin? Take out the 'i' from the word 'sin' and what do you get?... [silence from the devotees] Son! Therefore Jesus Christ was known as the Son of God because there was no 'i' in him. We are sinners because we still have?...'i'. Therefore we 'die'. When a man won the grace of his guru [spiritual preceptor, teacher], by his guru's grace he became prosperous. One day as he walked into the big factory he had built, he looked at the 500 people on one side and 1000 people working on the other side and the thought came to him: Imagine if I hadn't built this factory, 1500 people would be out of work! Just at that moment his guru walked in. He said to his guru after prostration and adoration, after offering all the required things, 'Gurudev, look at what I have done. I have built a factory and look at this factory. 1500 people are now able to afford bread and shelter'. His guru smiled and said, 'Yes my child…' Now look at the guru too. He doesn't bang it [the pride, ignorance, ego, ahamkara] on the head. The guru is a great psychologist. He is great. You don't know him yet. You'll still have to know him. He doesn't use psychology to trap people, but he uses it to give it a higher bent [perspective]. A higher…bent . So the guru says, 'Ah, very nice, so many people - 1500 people are living better. Come let's talk a walk in the fields.' They go to the fields and they come across a big rock. The guru says 'take a hammer and break this rock.' The devotee takes a large hammer and breaks the rock. Out of it jumps a bullfrog and water spills out. He looks at his chela [disciple] and says, 'Oooh, I suppose that you provided water in this rock too, and looked after this little life called frog'. 'No, no, no – it's nature…,' began the disciple. You are doing nothing. You are only a hosepipe [instrument], through which sometimes clean water comes and sometimes dirty water. When dirty water comes, that's when your own ego gets in – your own karma gets attached – then dirty water flows. But when you just become nothing….huh?....try it, try it, try it. Just become nothing. You will do the same things but it will give you a higher feeling inside. God's grace will be flowing and clean, pure, purifying water will flow. From that point of view Swami Vivekananda [spiritual heir to Sri Ramakrishna] makes it very clear. He says, 'My God in life, my saviour in life, Sri Ramakrishna – whatever good has come out of this mouth, a little inspiration wherever it has come out from this body - it is all his. And if anywhere I made a blunder – did anything wrong - it is mine.' He is so sure that ego must have taken over sometimes. That's why something went wrong. A devotee: No, no. I haven't got it. Why didn't you get it? Because the answer is here. Where is the answer? That you are not yet free and imagining inside you, for the grace [kripa] to flow. Sometime or other all of us get like that. All of us get?...like that. Anything that builds your ego [ahamkara], pride, position, is not spiritual. Anything. Even if God came and built it, it is not spiritual. 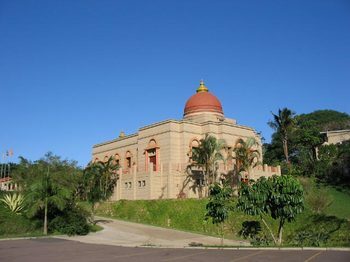 [Pravrajika] Atmaprana [the first sannyasini (Hindu nun) of the Ramakrishna Centre of South Africa]: What should one do then? Swamiji: You don't have to make a show of it. Inside you know it, mark it. In your own way try to be out of it. That's the secret of sadhana [spiritual practice]: in your own way. There is no show of it. You won't think; you'll do. That's natural. That's it. When people talk about complete surrender I get baffled sometimes. Don't take it as rude when I say, 'What do you know?' Somehow I am very frank saying things like that; trying to wake up something in you. All these days you must have thought, 'I have surrendered.' You have surrendered nothing. You go to your guru [spiritual preceptor] and you think "Hey, I give my guru all the things, I give him the highest." But it's nonsense. We have all thought like that. I also thought I was doing my guru's work. I'd think, "Hey, I am the highest." Come on, renounce. Renounce what? Renounce the ego, that is all there is to renounce. What is the ego? Desires. If you must have desires, let them only be that they take you towards God and not towards the world. We must practise wherever we are, however we are. Whether sitting, standing or sleeping, you must repeat God's name [the mantra]. It must go on all the time. Kundalini is a psychic thing so it does not really matter how you sit etc, that will happen of its own accord. But we must turn towards God. How? Japam [repetition of God's names or a mantra]. Even sleep must be driven off because it stops us from repeating God's name. Be simple like a child, that is the easiest way. Do not have [sexual] relations with your partner on the day of the full moon or the new moon, or on ekadasi. Ignorance clouds our knowledge of our own perfection. Meditation removes it. How do you get rid of ignorance? By repeating His [God’s] name. So he insults me - laugh and say, ‘Yes Ma [Divine Mother], it is you in him hurting me the ego.’ Do you think you will get God-realisation without hurt? Never. If you say, ‘I am angry,’ the ‘I’ is the narrow ‘I’ all the time. Rather get angry with God. Even smash his photo if you must. What spoils my remembrance of God? Name, fame, reward. You want the guru to pet you, fuss over you? This is weakness. Strength is when you do not want anything from the guru. Never mind what your wife, child, husband, mother, father do. See that what you do, is right. Come on. Be a great saint. It hurts to kill the ego. So get on. Chop it with the panga [machete] of knowledge. 1. The kingdom of God is within. Seek ye first the kingdom of God. Fears and impurities make us desire the wrong thing. True desire kills you [the egostistic you]. It is not difficult to realize God if you really want It. You should not desire much. You should leave it to God. What you desire most God fulfils in the body – quick as possible – even next birth. God speaks without interpreters. God gives various methods. In the course of meditation one must be merged in the Lord. If you float on the surface you cannot hope to reach the precious stones at the bottom. To attain siddhi powers it needs effort. But in a jivan mukta [liberated soul] it just happens, because of prarabdha karma [the karma being worked out in this life]. A jivan mukta never takes birth out of karma. An Incarnation comes from top to down. What is Consciousness? Be conscious of Consciousness. That is the most befitting word. It is heartening to see so many people gathered here today on this hallowed ground, created by my Gurudev, Swami Nischalananda. They are here to give us their blessings, hidden in packets of love. Created by them in times that we were together. And times that we were doing Master's work and serving Him. We forget the good things done to us. But God, in His divine nature, remembers the least good done to Him. I pray that Sri Ramakrishna gives us his nature to remember the good, the kindness, of today. The greatest incarnations appear in India. The greatest number of incarnations and the super evil souls - Kamsa, Ravana [characters from the Hindu epic, the Ramayana] etc. No matter how great the evil manifested, always the revealed Light is Divine. Swami Vivekananda said: 'The light of the soul in all beings, is potentially divine.' It is up to us to reveal this divinity. He came to India in a special way. He came to destroy: the evil of today; the misunderstanding of science; and the demon of ego. Science is put there to show us what a man is capable of, to make man humble. But now they are denying the very power that is the revealed manifestation of nature. It is easy to destroy people with a gun; it is difficult to do it in argument. And it is more difficult to put people on the right path to spiritual knowledge. The scriptures are there to show us that God exists, and to reveal God's power. How can God's power be shown to educated men and women - teachers etc - who travel on the vehicle of the ego? 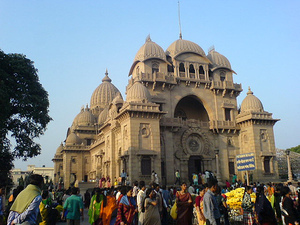 How did that young Brahmin boy in Dakshineshwar [Sri Ramakrishna in later life] - that divine corner of the earth - without education, show that the greatest secular knowledge can be defeated by humble devotion to God? He destroyed the ego. And the egoistic man was humbled by his simple parables and way of life. 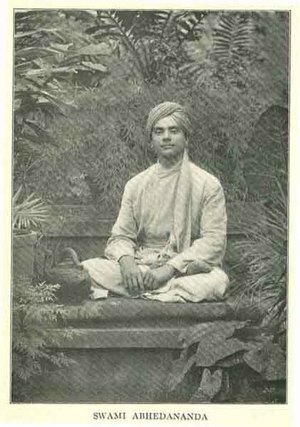 He only had a short stay on earth, but he created instruments to destroy evil in the world – instruments like Swami Vivekananda and Swami Abhedananda [pictured] [both direct monastic disciples]. These two started in the most materialistic country in the world, America.